This article is about the U.S. state of Oregon. For other uses, see Oregon (disambiguation). Oregon (/ˈɒrɪɡən/ ( listen) ORR-ih-gən) is a state in the Pacific Northwest region on the West Coast of the United States. The Columbia River delineates much of Oregon's northern boundary with Washington, while the Snake River delineates much of its eastern boundary with Idaho. The parallel 42° north delineates the southern boundary with California and Nevada. Oregon is one of only three states of the contiguous United States to have a coastline on the Pacific Ocean. State song(s): "Oregon, My Oregon"
Oregon was inhabited by many indigenous tribes before Western traders, explorers, and settlers arrived. 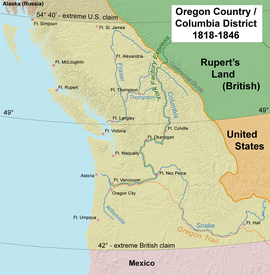 An autonomous government was formed in the Oregon Country in 1843 before the Oregon Territory was created in 1848. Oregon became the 33rd state on February 14, 1859. Today, at 98,000 square miles (250,000 km2), Oregon is the ninth largest and, with a population of 4 million, 27th most populous U.S. state. The capital, Salem, is the second most populous city in Oregon, with 169,798 residents. Portland, with 647,805, ranks as the 26th among U.S. cities. The Portland metropolitan area, which also includes the city of Vancouver, Washington, to the north, ranks the 25th largest metro area in the nation, with a population of 2,453,168. The earliest evidence of the name Oregon has Spanish origins. The term "orejón" comes from the historical chronicle Relación de la Alta y Baja California (1598) written by the new Spaniard Rodrigo Montezuma and made reference to the Columbia River when the Spanish explorers penetrated into the actual North American territory that became part of the Viceroyalty of New Spain. This chronicle is the first topographical and linguistic source with respect to the place name Oregon. There are also two other sources with Spanish origins, such as the name Oregano, which grows in the southern part of the region. It is most probable that the American territory was named by the Spaniards, as there are some populations in Spain such as "Arroyo del Oregón" (which is situated in the province of Ciudad Real), also considering that the individualization in Spanish language "El Orejón" with the mutation of the letter "g" instead of "j". The name, Oregon, is rounded down phonetically, from Ouve água—Oragua, Or-a-gon, Oregon—given probably by the same Portuguese navigator that named the Farallones after his first officer, and it literally, in a large way, means cascades: 'Hear the waters.' You should steam up the Columbia and hear and feel the waters falling out of the clouds of Mount Hood to understand entirely the full meaning of the name Ouve a água, Oregon. Another account, endorsed as the "most plausible explanation" in the book Oregon Geographic Names, was advanced by George R. Stewart in a 1944 article in American Speech. According to Stewart, the name came from an engraver's error in a French map published in the early 18th century, on which the Ouisiconsink (Wisconsin) River was spelled "Ouaricon-sint", broken on two lines with the -sint below, so there appeared to be a river flowing to the west named "Ouaricon". 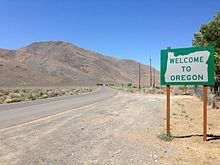 According to the Oregon Tourism Commission, present-day Oregonians /ˌɒrɪˈɡoʊniənz/ pronounce the state's name as "or-uh-gun, never or-ee-gone". After being drafted by the Detroit Lions in 2002, former Oregon Ducks quarterback Joey Harrington distributed "Orygun" stickers to members of the media as a reminder of how to pronounce the name of his home state. The stickers are sold by the University of Oregon Bookstore. Oregon is 295 miles (475 km) north to south at longest distance, and 395 miles (636 km) east to west. 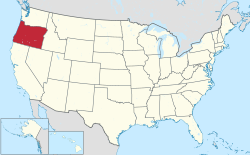 With an area of 98,381 square miles (254,810 km2), Oregon is slightly larger than the United Kingdom. It is the ninth largest state in the United States. Oregon's highest point is the summit of Mount Hood, at 11,249 feet (3,429 m), and its lowest point is the sea level of the Pacific Ocean along the Oregon Coast. Oregon's mean elevation is 3,300 feet (1,006 m). Crater Lake National Park is the state's only national park and the site of Crater Lake, the deepest lake in the United States at 1,943 feet (592 m). Oregon claims the D River as the shortest river in the world, though the state of Montana makes the same claim of its Roe River. Oregon is also home to Mill Ends Park (in Portland), the smallest park in the world at 452 square inches (0.29 m2). The Columbia River, which forms much of Oregon's northern border, also played a major role in the region's geological evolution, as well as its economic and cultural development. The Columbia is one of North America's largest rivers, and one of two rivers to cut through the Cascades (the Klamath River in southern Oregon is the other). About 15,000 years ago, the Columbia repeatedly flooded much of Oregon during the Missoula Floods; the modern fertility of the Willamette Valley is largely the result. Plentiful salmon made parts of the river, such as Celilo Falls, hubs of economic activity for thousands of years. Typical tree species include the Douglas fir (the state tree), as well as redwood, ponderosa pine, western red cedar, and hemlock. Ponderosa pine are more common in the Blue Mountains in the eastern part of the state and firs are more common in the west. 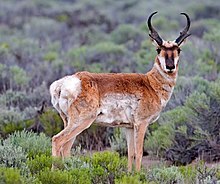 Many species of mammals live in the state, which include opossums, shrews, moles, little pocket mice, great basin pocket mice, dark kangaroo mouse, California kangaroo rat, chisel-toothed kangaroo rat, ord's kangaroo rat, bats, rabbits, pikas, mountain beavers, chipmunks, squirrels, yellow-bellied marmots, beavers (the state mammal), porcupines, coyotes, wolves, foxes black bears, raccoons, badgers, skunks, antelopes, cougars, bobcats, lynxes, deer, elk, and moose. Marine mammals include seals, sea lions, humpback whales, killer whales, gray whales, blue whales, sperm whales, pacific white-sided dolphins, and bottlenose dolphins..
Moose have not always inhabited the state but came to Oregon in the 1960s; the Wallowa Valley herd numbered about 60 as of 2013[update]. Gray wolves were extirpated from Oregon around 1930 but have since found their way back; most reside in northeast Oregon, with two packs living in the south-central part. Although their existence in Oregon is unconfirmed, reports of grizzly bears still turn up, and it is probable some still move into eastern Oregon from Idaho. Most of Oregon has a generally mild climate, though there is significant variation given the variety of landscapes across the state. The state's western region (west of the Cascade Range) has an oceanic climate, populated by dense evergreen mixed forests. Western Oregon's climate is heavily influenced by the Pacific Ocean; the western third of Oregon is very wet in the winter, moderately to very wet during the spring and fall, and dry during the summer. The relative humidity of Western Oregon is high except during summer days, which are semi-dry to semi-humid; Eastern Oregon typically sees low humidity year-round. The state's southwestern portion, particularly the Rogue Valley, has a Mediterranean climate with drier and sunnier winters and hotter summers, similar to Northern California. Oregon's northeastern portion has a steppe climate, and its high terrain regions have a subarctic climate. Like Western Europe, Oregon, and the Pacific Northwest in general, is considered warm for its latitude, and the state has far milder winters at a given elevation than comparable latitudes elsewhere in North America, such as the Upper Midwest, Ontario, Quebec and New England. However, the state ranks fifth for coolest summer temperatures of any state in the country, after Maine, Idaho, Wyoming, and Alaska. The eastern two thirds of Oregon, which largely comprise high desert, have cold, snowy winters and very dry summers. Much of the east is semiarid to arid like the rest of the Great Basin, though the Blue Mountains are wet enough to support extensive forests. Most of Oregon receives significant snowfall, but the Willamette Valley, where 60 percent of the population lives, has considerably milder winters for its latitude and typically only sees light snowfall. Humans have inhabited the area that is now Oregon for at least 15,000 years. In recorded history, mentions of the land date to as early as the 16th century. During the 18th and 19th centuries, European powers – and later the United States – quarreled over possession of the region until 1846, when the U.S. and Great Britain finalized division of the region. Oregon became a state on February 14, 1859, and as of 2015[update] is home to over 4 million residents. During the prehistoric period, the Willamette Valley region was flooded after the collapse of glacial dams from then Lake Missoula, located in what would later become Montana. These massive floods occurred during the last glacial period and filled the valley with 300 to 400 feet (91 to 122 m) of water. By the 16th century, Oregon was home to many Native American groups, including the Chinook, Coquille (Ko-Kwell), Bannock, Chasta, Kalapuya, Klamath, Klickitat, Molalla, Nez Perce, Takelma, Killamuk, Neah-kah-nie, Umatilla, and Umpqua. Monument near Coos Bay, Oregon, of Francis Drake's first North American Encounter. Plaque by Oregon State Parks and Oregon Historical Society. The first Europeans to visit Oregon were Spanish explorers led by Juan Rodríguez Cabrillo, who sighted southern Oregon off the Pacific coast in 1543. Sailing Golden Hind in search of the Strait of Anian, Drake briefly sought shelter anchoring at South Cove, Cape Arago, just south of Coos Bay, Oregon, before sailing for what is now California. Exploration was retaken routinely in 1774, starting with the expedition of the frigate Santiago by Juan José Pérez Hernández (see Spanish expeditions to the Pacific Northwest), and the coast of Oregon became a valuable trading route to Asia. In 1778, British captain James Cook also explored the coast. Beginning in the 1880s, the growth of railroads expanded the state's lumber, wheat, and other agricultural markets, and the rapid growth of its cities. Due to the abundance of timber and waterway access via the Willamette River, Portland became a major force in the lumber industry of the Pacific Northwest, and quickly became the state's largest city. It would earn the nickname "Stumptown", and would later become recognized as one of the most dangerous port cities in the United States due to racketeering and illegal activities at the turn of the 20th century. In 1902, Oregon introduced direct legislation by the state's citizens through initiatives and referenda, known as the Oregon System. On May 5, 1945, six people were killed by a Japanese bomb that exploded on Gearhart Mountain near Bly. This is the only fatal attack on the United States mainland committed by a foreign nation since the Mexican–American War, making Oregon the only U.S. state that has experienced fatal casualties by a foreign army since 1848. The bombing site is now located in the Mitchell Recreation Area. Astoria, at the mouth of the Columbia River, was the first permanent English-speaking settlement west of the Rockies in what is now the United States. Oregon City, at the end of the Oregon Trail, was the Oregon Territory's first incorporated city, and was its first capital from 1848 until 1852, when the capital was moved to Salem. Bend, near the geographic center of the state, is one of the ten fastest-growing metropolitan areas in the United States. [better source needed] In southern Oregon, Medford is a rapidly growing metro area and is home to the Rogue Valley International-Medford Airport, the state's third-busiest airport. To the south, near the California border, are the communities of Ashland and Grants Pass. Governors in Oregon serve four-year terms and are limited to two consecutive terms, but an unlimited number of total terms. 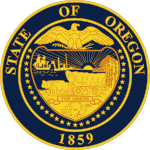 Oregon has no lieutenant governor; in the event that the office of governor is vacated, Article V, Section 8a of the Oregon Constitution specifies that the Secretary of State is first in line for succession. The other statewide officers are Treasurer, Attorney General, Superintendent, and Labor Commissioner. The biennial Oregon Legislative Assembly consists of a thirty-member Senate and a sixty-member House. The state supreme court has seven elected justices, currently including the only two openly gay state supreme court justices in the nation. They choose one of their own to serve a six-year term as Chief Justice. The debate over whether to move to annual sessions is a long-standing battle in Oregon politics, but the voters have resisted the move from citizen legislators to professional lawmakers. Because Oregon's state budget is written in two-year increments and, there being no sales tax, state revenue is based largely on income taxes, it is often significantly over- or under-budget. Recent legislatures have had to be called into special session repeatedly to address revenue shortfalls resulting from economic downturns, bringing to a head the need for more frequent legislative sessions. Oregon Initiative 71, passed in 2010, mandates the legislature to begin meeting every year, for 160 days in odd-numbered years, and 35 days in even-numbered years. Oregonians have voted for the Democratic presidential candidate in every election since 1988. In 2004 and 2006, Democrats won control of the state Senate, and then the House. 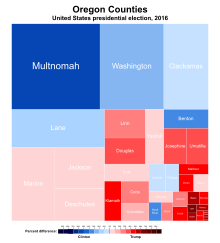 Since the late 1990s, Oregon has been represented by four Democrats and one Republican in the U.S. House of Representatives. Since 2009, the state has had two Democratic U.S. senators, Ron Wyden and Jeff Merkley. Oregon voters have elected Democratic governors in every election since 1986, most recently electing Kate Brown over Republican Bud Pierce in a 2016 special election. Like all U.S. states, Oregon is represented by two senators. Since the 1980 census, Oregon has had five congressional districts. After Oregon was admitted to the Union, it began with a single member in the House of Representatives (La Fayette Grover, who served in the 35th United States Congress for less than a month). Congressional apportionment increased the size of the delegation following the censuses of 1890, 1910, 1940, and 1980. A detailed list of the past and present Congressional delegations from Oregon is available. While Republicans typically win more counties by running up huge margins in the east, the Democratic tilt of the more populated west is usually enough to swing the entire state Democratic. In 2008, for instance, Republican Senate incumbent Gordon H. Smith lost his bid for a third term, even though he carried all but eight counties. His Democratic challenger, Jeff Merkley, won Multnomah County by 142,000 votes, more than double the overall margin of victory. During Oregon's history, it has adopted many electoral reforms proposed during the Progressive Era, through the efforts of William S. U'Ren and his Direct Legislation League. 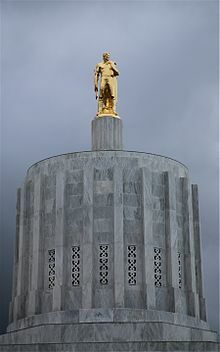 Under his leadership, the state overwhelmingly approved a ballot measure in 1902 that created the initiative and referendum for citizens to introduce or approve proposed laws or amendments to the state constitution directly, making Oregon the first state to adopt such a system. Today, roughly half of U.S. states do so. As of 2015[update], Oregon ranks as the 17th highest in median household income at $60,834. The gross domestic product (GDP) of Oregon in 2013 was $219.6 billion, a 2.7% increase from 2012; Oregon is the 25th wealthiest state by GDP. In 2003, Oregon was 28th in the U.S. by GDP. The state's per capita personal income (PCPI) in 2013 was $39,848, a 1.5% increase from 2012. Oregon ranks 33rd in the U.S. by PCPI, compared to 31st in 2003. The national PCPI in 2013 was $44,765. In the southern Oregon coast, commercially cultivated cranberries account for about 7 percent of U.S. production, and the cranberry ranks 23rd among Oregon's top 50 agricultural commodities. 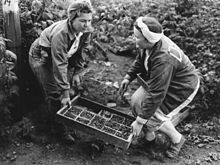 Cranberry cultivation in Oregon uses about 27,000 acres (110 square kilometers) in southern Coos and northern Curry counties, centered around the coastal city of Bandon. In the northeastern region of the state, particularly around Pendleton, both irrigated and dry land wheat is grown. Oregon farmers and ranchers also produce cattle, sheep, dairy products, eggs and poultry. Vast forests have historically made Oregon one of the nation's major timber-producing and logging states, but forest fires (such as the Tillamook Burn), over-harvesting, and lawsuits over the proper management of the extensive federal forest holdings have reduced the timber produced. Between 1989 and 2011, the amount of timber harvested from federal lands in Oregon dropped about 90%, although harvest levels on private land have remained relatively constant. Portland is home to the Oregon Museum of Science and Industry, the Portland Art Museum, and the Oregon Zoo, which is the oldest zoo west of the Mississippi river. The International Rose Test Garden is another prominent attraction in the city. Portland has also been named the best city in the world for street food by several publications, including the U.S. News & World Report and CNN. Oregon is home to many breweries, and Portland has the largest number of breweries of any city in the world. In Southern Oregon, the Oregon Shakespeare Festival, held in Ashland, is also a tourist draw, as is the Oregon Vortex and the Wolf Creek Inn State Heritage Site, a historic inn where Jack London wrote his 1913 novel Valley of the Moon. Oregon has also historically been a popular region for film shoots due to its diverse landscapes, as well as its proximity to Hollywood (see List of films shot in Oregon). Movies filmed in Oregon include: Animal House, Free Willy, The General, The Goonies, Kindergarten Cop, One Flew Over the Cuckoo's Nest, and Stand By Me. Oregon native Matt Groening, creator of The Simpsons, has incorporated many references from his hometown of Portland into the TV series. Additionally, several television shows have been filmed throughout the state including Portlandia, Grimm, Bates Motel, and Leverage. The Oregon Film Museum is located in the old Clatsop County Jail in Astoria. The spinoffs and startups that were produced by these two companies led to the establishment in that area of the so-called Silicon Forest. The recession and dot-com bust of 2001 hit the region hard; many high technology employers reduced the number of their employees or went out of business. Open Source Development Labs made news in 2004 when they hired Linus Torvalds, developer of the Linux kernel. In 2010, biotechnology giant Genentech opened a $400 million facility in Hillsboro to expand its production capabilities. Oregon is home to several large datacenters that take advantage of cheap power and a climate conducive to reducing cooling costs. Google operates a large datacenter in The Dalles, and Facebook built a large datacenter near Prineville in 2010. Amazon opened a datacenter near Boardman in 2011, and a fulfillment center in Troutdale in 2018. In 2015, a total of seven companies headquartered in Oregon landed in the Fortune 1000: Nike, at 106; Precision Castparts Corp. at 302; Lithia Motors at 482; StanCorp Financial Group at 804; Schnitzer Steel Industries at 853; The Greenbrier Companies at 948; and Columbia Sportswear at 982. The state also has a minimum corporate tax of only $150 a year, amounting to 5.6% of the General Fund in the 2005–7 biennium; data about which businesses pay the minimum is not available to the public. [better source needed] As a result, the state relies on property and income taxes for its revenue. Oregon has the fifth highest personal income tax in the nation. According to the U.S. Census Bureau, Oregon ranked 41st out of the 50 states in taxes per capita in 2005 with an average amount paid of 1,791.45. The United States Census Bureau estimates that the population of Oregon was 4,190,713 on July 1, 2018, a 9.39% increase over the 2010 United States Census. Oregon was the U.S.'s "Top Moving Destination" in 2014, with two families moving into the state for every one moving out of state (66.4% to 33.6%). Oregon was also the top moving destination in 2013, and second most popular destination in 2010 through 2012. The table below shows the racial composition of Oregon's population as of 2016. According to the 2016 American Community Survey, 12.4% of Oregon's population were of Hispanic or Latino origin (of any race): Mexican (10.4%), Puerto Rican (0.3%), Cuban (0.1%), and other Hispanic or Latino origin (1.5%). The five largest ancestry groups were: German (19.1%), Irish (11.7%), English (11.3%), American (5.3%), and Norwegian (3.8%). As of 2011[update], 38.7% of Oregon's children under one year of age belonged to minority groups, meaning they had at least one parent who was not a non-Hispanic white. Of the state's total population, 22.6% was under the age 18, and 77.4% were 18 or older. As of 2009[update], Oregon's population comprised 361,393 foreign-born residents. Of the foreign-born residents, the three largest groups are originally from countries in: Latin America (47.8%), Asia (27.4%), and Europe (16.5%). Percentage of population identifying as Hispanic or Latino by county. Johnson Hall at the University of Oregon. Especially since the 1990 passage of Measure 5, which set limits on property tax levels, Oregon has struggled to fund higher education. Since then, Oregon has cut its higher education budget and now ranks 46th in the country in state spending per student. However, 2007 legislation funded the university system far beyond the governor's requested budget though still capping tuition increases at 3% per year. Oregon supports a total of seven public universities and one affiliate. It is home to three public research universities: The University of Oregon (UO) in Eugene and Oregon State University (OSU) in Corvallis, both classified as research universities with very high research activity, and Portland State University which is classified as a research university with high research activity. Providence Park during a Portland Thorns FC match. The Portland Timbers play at Providence Park, just west of downtown Portland. The Timbers have a strong following, with the team regularly selling out its games. The Timbers repurposed the formerly multi-use stadium into a soccer-specific stadium in fall 2010, increasing the seating in the process. The Timbers operate Portland Thorns FC, a women's soccer team that has played in the National Women's Soccer League since the league's first season in 2013. The Thorns, who also play at Providence Park, have won two league championships, in the inaugural 2013 season and also in 2017, and have been by far the NWSL's attendance leader in each of the league's seasons. Eugene, Salem and Hillsboro have minor-league baseball teams: the Eugene Emeralds, the Salem-Keizer Volcanoes, and the Hillsboro Hops all play in the Single-A Northwest League. Portland has had minor-league baseball teams in the past, including the Portland Beavers and Portland Rockies, who played most recently at Providence Park when it was known as PGE Park. The Oregon State Beavers and the University of Oregon Ducks football teams of the Pac-12 Conference meet annually in the Civil War. Both schools have had recent success in other sports as well: Oregon State won back-to-back college baseball championships in 2006 and 2007, winning a third in 2018; and the University of Oregon won back-to-back NCAA men's cross country championships in 2007 and 2008. ^ Hall, Calvin (January 30, 2007). "English as Oregon's official language? It could happen". The Oregon Daily Emerald. Retrieved May 8, 2007. ^ a b "Median Annual Household Income". The Henry J. Kaiser Foundation. Retrieved December 9, 2016. ^ "Mount Hood Highest Point". NGS data sheet. U.S. National Geodetic Survey. Retrieved October 24, 2011. ^ a b Beale, Bob (April 10, 2003). "Humungous fungus: world's largest organism?". Environment & Nature News. ABC. Retrieved December 9, 2016. ^ a b "Forest Land Protection Program". Oregon Department of Fish and Wildlife. Retrieved November 7, 2016. ^ "Financial Statements for Nike, Inc". Google Finance. Retrieved April 17, 2017. ^ Secretaría de Comunicaciones y Transportes 1988, p. 149. ^ Johnson 1904, p. 51. ^ Elliott, T.C. (June 1921). "The Origin of the Name Oregon". Oregon Historical Quarterly. XXIII (2): 99–100. ISSN 0030-4727. OCLC 1714620 – via Google Books. ^ Miller, Joaquin (September 1904). "The Sea of Silence". Sunset. XIII (5): 395–396 – via Google Books. ^ "Oregon Fast Facts". Travel Oregon. Archived from the original on March 23, 2012. ^ Banks, Don (April 21, 2002). "Harrington confident about Detroit QB challenge". Sports Illustrated. ^ "Yellow/Green ORYGUN Block Letter Outside Decal". UO Duck Store. Archived from the original on December 8, 2010. Retrieved August 3, 2011. ^ "Elevations and Distances in the United States". U.S Geological Survey. April 29, 2005. Archived from the original on October 15, 2011. Retrieved November 7, 2006. 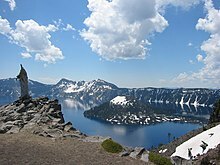 ^ "Crater Lake National Park". U.S. National Park Service. Retrieved November 22, 2006. ^ "World's Shortest River". Travel Montana. Archived from the original on July 2, 2007. Retrieved May 11, 2007. ^ Ray, Dewey (March 27, 1980). "Oregon volcano may be warming up for an eruption". Christian Science Monitor. Retrieved October 31, 2010. ^ "Congressional Record Vol. 155 Part 1: Proceedings and Debates of the 111th Congress: First Session". Government Printing Office: 935 – via Google Books. ^ a b "Oregon's Forests: Some Facts and Figures" (PDF). Oregon.gov. Forest Figures. September 2009. Retrieved May 30, 2017. ^ "Oregon is top timber producer in worst year". Mail Tribune. Archived from the original on March 2, 2014. Retrieved September 17, 2010. ^ "Trees of Oregon's forests". Tree Variety. Oregon Forest Resources Institute. Retrieved December 28, 2016. ^ "Mammals: Pocket Mice, Kangaroo Rats and Kangaroo Mouse". Oregon Department of Fish and Wildlife. Oregon Wildlife Species. Retrieved November 7, 2016. ^ "Mammals: Coyotes, wolves and foxes". Oregon Department of Fish and Wildlife. Oregon Wildlife Species. Retrieved November 8, 2016. ^ "Mammals: Whale, dolphin and porpoise". Oregon Department of Fish and Wildlife. Oregon Wildlife Species. Retrieved November 7, 2016. ^ "Moose enter Oregon, so are grizzlies next?". Tri City Herald. Archived from the original on July 6, 2014. Retrieved November 1, 2008. ^ Hamilton, John (2016). Oregon. ABDO. p. 14. ISBN 978-1-680-77443-6. ^ a b c "Climate of Oregon". Desert Research Institute. Retrieved December 10, 2016. ^ Jones, Gregory V. "Rogue Valley Weather and Climate" (PDF). Oregon State University. Archived from the original (PDF) on December 20, 2016. Retrieved December 9, 2016. ^ Osborn, Liz. "Coldest States in America". Current Results. Retrieved December 23, 2017. ^ Conlon T.D. ; Wozniak, K.C. ; Woodcock, D.; Herrera, N.B. ; Fisher, B.J. ; Morgan, D.S. ; Lee, K.K. & Hinkle, S.R. (2005). "Ground-Water Hydrology of the Willamette Basin, Oregon". Scientific Investigations Report 2005-5168. U.S. Geological Survey. Retrieved February 19, 2015. ^ Boone 2004, p. 9. ^ a b c "QuickFacts Oregon; UNITED STATES". 2018 Population Estimates. United States Census Bureau, Population Division. February 23, 2019. Retrieved February 23, 2019. ^ Maugh II, Thomas H. (July 12, 2012). "Who was first? New info on North America's earliest residents". The Los Angeles Times. Retrieved November 8, 2016. ^ Carey 1922, p. 47. ^ Hemming 2008, pp. 140–141. ^ Von der Porten, Edward (January 1975). "Drake's First Landfall". Pacific Discovery, California Academy of Sciences. 28 (1): 28–30. ^ Johnson 1904, p. 39. ^ Johnson 1904, pp. 64–65. ^ Ambrose 1997, p. 326. ^ Johnson 1904, pp. 145–146. ^ Johnson 1904, p. 146. ^ Loy et al. 2001, pp. 12–13. ^ Johnson 1904, p. 221. ^ Johnson 1904, p. 207. ^ Johnson 1904, p. 226. ^ Johnson 1904, p. 215. ^ Johnson 1904, p. 273. ^ Johnson 1904, p. 285. ^ McClintock, Thomas C. (July 1, 1995). "James Saules, Peter Burnett, and the Oregon Black Exclusion Law of June 1844". The Pacific Northwest Quarterly. 86 (3): 122. ^ Mahoney, Barbara (July 1, 2009). "Oregon Voices: Oregon Democracy: Asahel Bush, Slavery, and the Statehood Debate". Oregon Historical Quarterly. 110 (2): 202. ^ McLagan 1980, p. 28. ^ Engeman, Richard H. (2005). "Architectural Fashions and Industrial Pragmatism, 1865–1900". The Oregon History Project. Oregon Historical Society. Retrieved June 17, 2016. ^ Evans 1966, p. 156. ^ "On This Day: Japanese WWII Balloon Bomb Kills 6 in Oregon". Finding Dulcinea. May 5, 2011. Retrieved April 9, 2017. ^ "Mitchell Monument Historic Site". US Department of Agriculture Forest Service. Retrieved December 9, 2016. ^ Toll, William (2003). "Home Front Boom". Oregon Historical Society. Archived from the original on June 9, 2011. Retrieved October 30, 2015. ^ Taylor, Alan (July 26, 2013). "America in the 1970s: The Pacific Northwest". The Atlantic. Retrieved November 8, 2016. ^ Mapes, Jeff (May 8, 2014). "Gay marriage, marijuana legalization measures show strong support in new Oregon poll". The Oregonian. Retrieved April 9, 2017. ^ "2010 Census Redistricting Data". U.S. Census Bureau. Archived from the original on July 21, 2011. Retrieved March 15, 2011. ^ 50 Fastest-Growing Metro Areas Concentrated in West and South. Archived April 1, 2013, at the Wayback Machine U.S. Census Bureau 2005. Retrieved October 16, 2007. 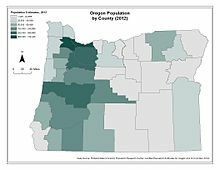 ^ "Biggest US Cities By Population - Oregon - 2017 Populations". Biggest US Cities. Biggest US Cities. Retrieved February 23, 2019. ^ "U.S. Census Bureau QuickFacts: Portland city, Oregon". www.census.gov. ^ Allen, Cain (2006). "A Pacific Republic". The Oregon History Project. Oregon Historical Society. Retrieved June 17, 2016. ^ Johnson 1904, p. 296. ^ "ORS 653.025". State of Oregon. ^ "November 2, 2004, General Election Abstract of Votes: STATE MEASURE NO. 36" (PDF). Oregon Secretary of State. Retrieved November 17, 2008. ^ Bradbury, Bill (November 6, 2007). "Official Results – November 6, 2007 Special Election". Elections Division. Oregon Secretary of State. Retrieved December 27, 2008. ^ a b Leip, David. 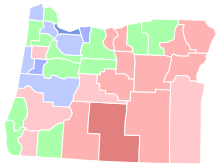 "General Election Results – Oregon". United States Election Atlas. Retrieved November 18, 2016. ^ Kost, Ryan (May 5, 2012). "Politics of Place: In northeastern Oregon, politics revolve around natural resources". The Oregonian. Retrieved April 17, 2017. ^ Silver, Nate (May 17, 2008). "Oregon: Swing state or latte-drinking, Prius-driving lesbian commune?". FiveThirtyEight.com. Archived from the original on March 7, 2010. Retrieved February 24, 2010. ^ "State Initiative and Referendum Summary". State Initiative & Referendum Institute at USC. Archived from the original on February 11, 2016. Retrieved November 27, 2006. ^ "Eighth Annual Report on Oregon's Death with Dignity Act" (PDF). Oregon Department of Human Services. March 9, 2006. Retrieved June 11, 2007. ^ "Oregon Health Plan: An Historical Review" (PDF). Oregon Department of Human Services. July 2006. Retrieved December 28, 2016. ^ "Oregon Presidential Race Results: Hillary Clinton Wins". The New York Times. December 13, 2016. Retrieved February 21, 2017. ^ "BEARFACTS: Oregon". Bureau of Economic Analysis. 2014. Retrieved February 27, 2015. ^ "School hiring fuels Oregon job growth in September". Associated Press. October 18, 2016. Retrieved October 21, 2016. ^ "Labor Force Statistics from the Current Population Survey". Bureau of Labor Statistics. Retrieved October 21, 2016. ^ Izzo, Phil (August 9, 2013). "Food-Stamp Use Rises; Some 15% Get Benefits". The Wall Street Journal. Retrieved April 9, 2017. ^ McNab, W. Henry; Avers, Peter E (July 1994). Ecological Subregions of the United States. Chapter 24. U.S. Forest Service and Dept. of Agriculture. ^ Hogen, Junnelle (September 11, 2016). "Oregon blueberry yield topples records, expands overseas". Statesman Journal. Retrieved November 5, 2016. ^ Keates, Nancy (October 15, 2015). "Oregon Vineyards Draw Out-of-State Buyers". The Wall Street Journal. Retrieved November 7, 2016. ^ Weaver, Matthew (July 1, 2014). "Oregon farmers kick off wheat harvest". Capital Press. Retrieved November 8, 2016. ^ "Oregon Forest Facts & Figures 2013" (PDF). Oregon Forest Resources Institute. p. 3. Archived from the original (PDF) on July 12, 2014. Retrieved May 31, 2014. ^ "Salmon and Steelhead Fishing". Oregon Department of Fish and Wildlife. Retrieved November 7, 2016. ^ Energy Information Administration (April 29, 2010). "State Energy Profiles – Oregon". United States Department of Energy. Retrieved December 10, 2016. ^ Richard, Terry (March 1, 2015). "7 Wonders of Oregon begin second Travel Oregon ad campaign season on TV, at movies". The Oregonian. Retrieved November 7, 2016. ^ "History [of Oregon Zoo]". Oregon Zoo. Retrieved April 11, 2012. ^ "World's Best Street Food". U.S. News. ^ "World's Best Street Food". CNN Travel. July 19, 2010. ^ "Oregon Coast Information". Travel Oregon. Retrieved December 10, 2016. ^ Frazier, Joseph B. (May 6, 2008). "Oregon's coast is easy and affordable to see by car". USA Today. Retrieved March 9, 2010. 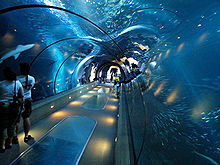 ^ "Top 10 Aquariums". Coastal Living. Retrieved March 9, 2010. ^ "Information". Sea Lion Caves. Retrieved December 10, 2016. ^ John, Finn J.D. (April 4, 2010). "Wolf Creek Inn was writing retreat for Jack London". Offbeat Oregon. Retrieved November 8, 2016. ^ "Filmed in Oregon 1908–2015" (PDF). Oregon Film Council. Archived from the original (PDF) on August 14, 2014. Retrieved December 27, 2015. ^ Hamilton, Don (July 19, 2002). "Matt Groening's Portland". The Portland Tribune. Retrieved March 7, 2007. ^ "Oregon Film History". Welcome to Oregon Film. May 17, 2016. Retrieved January 23, 2019. ^ Rogoway, Mike (August 7, 2018). "Amazon begins hiring for 1,500 Troutdale warehouse jobs". The Oregonian. Retrieved October 4, 2018. ^ "Companies in Oregon". NASDAQ. Archived from the original on April 17, 2017. Retrieved December 30, 2016. ^ "Portland – Adidas Group". Adidas. Retrieved April 17, 2017. ^ "Nike Locations". Nike. Archived from the original on March 27, 2014. Retrieved March 27, 2014. ^ Walker, Mason (June 4, 2015). "Oregon lands 7 companies on Fortune 1000, up from 5 last year". Portland Business Journal. Retrieved November 7, 2016. ^ "Oregon Governor's Budget" (PDF). State of Oregon. ^ "25th Anniversary Issue". Willamette Week. 1993. Archived from the original on December 30, 2006. Retrieved June 11, 2007. ^ "Oregon Revised Statutes 317.090 Minimum tax". ^ "Oregon ranks 41st in taxes per capita". Portland Business Journal. March 31, 2006. Retrieved June 10, 2007. ^ "Arts Tax". The City of Portland, Oregon. Retrieved November 30, 2016. ^ "Oregon Transit Self-Employment Taxes" (PDF). Oregon.gov. Retrieved November 30, 2016. ^ "Oregon Employer's Guide" (PDF). Oregon.gov. Retrieved November 30, 2016. ^ "Oregon's 2% Kicker" (PDF). Oregon State Leglislative Review Office. Archived from the original (PDF) on June 14, 2007. Retrieved June 10, 2007. ^ Cain, Brad (March 2, 2006). "Kicker tax rebate eyed to help school and state budgets". KATU. ^ Cooper, Matt (March 9, 2007). "County may scrub income tax". The Register-Guard. Archived from the original on July 21, 2011. Retrieved March 9, 2007. ^ "2006 Oregon full-year resident tax form instructions". (PDF) Oregon.Gov. ^ "Oregon" (PDF). Resident Population and Apportionment of the U.S. House of Representatives. U.S. Census Bureau. December 27, 2000. Retrieved August 28, 2009. ^ Resident Population Data. "Resident Population Data – 2010 Census". 2010.census.gov. Archived from the original on January 1, 2011. Retrieved February 7, 2016. ^ "Certified Population Estimates for Oregon and Its Counties" (PDF). Portland State University Population Research Center. Retrieved October 30, 2013. ^ "2014 National Movers Study". United Van Lines. January 2, 2015. Retrieved January 14, 2015. ^ "2013 United Van Lines Migration Study". United Van Lines. January 2, 2014. Retrieved January 14, 2015. ^ "United Van Lines 2012 Migration Study Reveals Northeastern U.S. Exodus". United Van Lines. January 2, 2013. Retrieved January 14, 2015. ^ "2011 United Van Lines Migration Study". United Van Lines. January 3, 2012. Retrieved January 14, 2015. The Western United States is also represented on the high-inbound list with Oregon (60.8%) and Nevada (56.9%) both making the list. Oregon is number two for inbound migration for the second year in a row. ^ a b "2010 Demographic Profile Data". U.S. Census Bureau. ^ a b "Historical Census Statistics on Population Totals By Race, 1790 to 1990, and By Hispanic Origin, 1970 to 1990, For The United States, Regions, Divisions, and States". Archived from the original on July 25, 2008. ^ "Oregon QuickFacts". U.S. Census Bureau. Archived from the original on February 5, 2017. 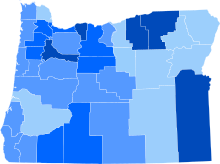 ^ "Oregon – Race and Hispanic Origin: 1850 to 1990". U.S. Census Bureau. Archived from the original on July 25, 2008. ^ "Population and Population Centers by State: 2000". U.S. Census Bureau. Archived from the original on January 17, 2010. Retrieved November 23, 2006. ^ According to the U.S. Census Bureau, Oregon's population as of 2017 is 4,190,713; with the MSA being 2,453,168, this leaves 59%~ of Oregon's population residing within the metro. ^ a b "Selected Social Characteristics in the United States: 2007–2009: 2007–2009 American Community Survey 3-Year Estimates (Oregon)". U.S Census Bureau. Archived from the original on April 17, 2016. Retrieved December 9, 2016. ^ "Religious Landscape Study – Oregon". The Pew Forum. Retrieved September 12, 2015. ^ Nicks, Denver (February 3, 2014). "These Are The Most Godless States in America". Time. Retrieved December 30, 2016. ^ Mapes, Jeff (February 13, 2013). "Oregon not quite most 'unchurched' state -- but close, new survey finds". The Oregonian. Retrieved June 9, 2017. ^ "Oregon and Vermont Are Least Religious States". Science and Religion Today. August 10, 2009. Retrieved June 17, 2017. ^ Newport, Frank (August 7, 2009). "Religious identity: States differ widely". Gallup. Retrieved December 23, 2009. ^ "State Membership Report". The Association of Religion Data Archives. Retrieved December 5, 2013. ^ Binus, Joshua. "The Oregon History Project: Russian Old Believers". Oregon Historical Society. Retrieved March 14, 2008. ^ Kosmin, Barry A; Keysar, Ariela (December 23, 2009). "American Religious Identification Survey" (PDF). Hartford: Trinity College. Archived from the original (PDF) on July 17, 2011. ^ Kosmin, Barry A; Keysar, Ariela; Cragun, Ryan; Navarro-Rivera, Juhem. "American nones: The profile of the no religion population" (PDF). Hartford: Trinity College. Archived from the original (PDF) on October 7, 2009. Retrieved December 23, 2009. ^ Wentz, Patty (February 11, 1998). "He's back." Archived September 18, 2008, at the Wayback Machine Willamette Week. Retrieved March 14, 2008. ^ Martin, Joyce A.; And others (January 15, 2015). "Births: Final Data for 2013" (PDF). National Vital Statistics Reports. 64 (4). ^ Hamilton, Brady E.; And others (December 23, 2015). "Births: Final Data for 2014" (PDF). National Vital Statistics Reports. 64 (12). ^ Martin, Joyce A.; And others (January 5, 2017). "Births: Final Data for 2015" (PDF). National Vital Statistics Reports. 66 (1). ^ "Interim Projections of the Total Population for the United States and States: April 1, 2000 to July 1, 2030" (PDF). U.S. Census Bureau. April 21, 2005. Archived from the original (PDF) on June 15, 2010. Retrieved August 18, 2010. ^ "State and County Population Forecasts and Components of Change, 2000 to 2040". Oregon Department of Administrative Services, Office of Economic Analysis. April 2004. Archived from the original on May 17, 2004. Retrieved August 25, 2010. 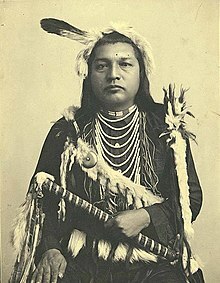 ^ a b "Oregon Almanac: Native Americans to shoes, oldest". Oregon Blue Book. Retrieved November 6, 2016. ^ "2016 Largest School Districts in Oregon". Niche. Retrieved November 7, 2016. ^ "Higher education gets higher priority". Daily Emerald. Eugene, OR. June 29, 2007. Retrieved February 5, 2016. ^ "New Carnegie Classification of Institutions of Higher Education Website Coming in January 2015". Carnegie Foundation for the Advancement of Teaching. October 8, 2014. Retrieved November 22, 2014. ^ "Colleges in Oregon". US News & World Report. Retrieved December 7, 2016. ^ "University of Oregon". US News & World Report. Retrieved December 8, 2016. ^ Dietz, Diane (November 11, 2014). "Enrollment: UO falls, OSU gains". Register-Guard. Retrieved December 30, 2016. ^ "Oregon State University" (PDF). Archived from the original (PDF) on October 22, 2015. 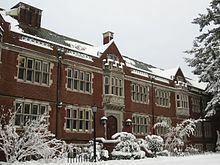 ^ "Reed College". Forbes. Retrieved September 11, 2015. ^ "MLS awards team to Portland for 2011." Archived March 27, 2009, at the Wayback Machine Portland Timbers, March 20, 2009. ^ Wieranga, Jay (August 31, 2013). 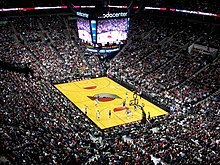 "Ranking the Top 25 Players in Portland Trail Blazers History". Bleacher Report. Retrieved December 28, 2016. ^ Mejia, Tony (October 13, 2007). "Oden's loss hurts, but team in good hands". News. CBS. Retrieved January 15, 2008. ^ "Venues". Rose Quarter. Archived from the original on March 13, 2014. Retrieved January 15, 2008. ^ Wahl, Grant (March 14, 2014). "2014 MLS Ambition Rankings: Toronto FC rises to No. 1 | Planet Futbol – SI.com". Soccer.si.com. Archived from the original on March 21, 2014. Retrieved April 22, 2014. ^ "Teams and Events". PGE Park. Archived from the original on July 19, 2006. Retrieved January 15, 2008. ^ "Northwest League". Minor League Baseball. Retrieved January 15, 2008. ^ "Oregon State baseball closes out unfinished business with 2018 College World Series championship". NCAA.com. June 28, 2018. Retrieved July 4, 2018. ^ a b c d Van Winkle, Teresa (June 2008). "Background brief on international trade" (PDF). Oregon Legislature. Archived from the original (PDF) on September 9, 2008. Retrieved July 21, 2008. ^ a b "Governor's mission to Asia will stress trade and cultural ties". Secretary of State. October 24, 1995. Archived from the original on July 7, 2012. Retrieved April 2, 2008. ^ "Oregon Laws". Senate Concurrent Resolution. Oregon Legislature. 2005. Archived from the original on June 11, 2011. Allen, John Elliott; Burns, Marjorie; Sargent, Sam C. (2009). Cataclysms on the Columbia. Ooligan Press. ISBN 978-1-932010-31-2. Ambrose, Stephen E. (1997). Undaunted Courage: Meriwether Lewis, Thomas Jefferson, and the Opening of the American West (1st Touchstone ed.). New York: Simon & Schuster. ISBN 978-0-684-82697-4. Boone, Mary (2004). Uniquely Oregon. Chicago, Illinois: Heinemann Library. ISBN 978-1-4034-4659-6. Carey, Charles Henry (1922). History of Oregon: Volume 1. Pioneer Historical Publishing Co.
Evans, Tony Howard (1966). Oregon Progressive Reform, 1902–1914. University of California Press. Hemming, John (2008). Atlas of Exploration. Oxford University Press. ISBN 978-0-19-534318-2. Jewell, Judy; McRae, W.C. (2014). Moon Oregon. Moon Travel. ISBN 978-1-61238-756-7. Johnson, Sidona V. (1904). A Short History of Oregon. Chicago: A.C. McClurg & Co.
Loy, Willam G.; Allan, Stuart; Buckley, Aileen R.; Meacham, James E. (2001). Atlas of Oregon. University of Oregon Press. ISBN 978-0-87114-101-9. McLagan, Elizabeth (1980). A Peculiar Paradise: A History of Blacks in Oregon, 1778–1940. Georgian Press. ISBN 978-0-9603408-2-8. Robbins, William G. (2005). Oregon: This Storied Land. Oregon Historical Society Press. ISBN 978-0-87595-286-4. Secretaría de Comunicaciones y Transportes (1988). Historia de las comunicaciones y los transportes en México (in Spanish). 5. Secretaría de Comunicaciones y Transportes.